Author Interview with Christine Hughes… and a GIVEAWAY! I’m so excited to have fellow Black Opal Books author, Christine Hughes, with us today! 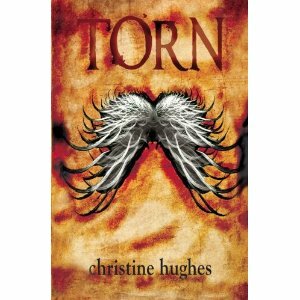 Her debut novel, TORN, was released Saturday June 9, 2012 to the masses. I’m hearing great things about it and I can’t wait to read! If you haven’t already, pick up your copy of TORN. And the best news of today? One lucky commenter will receive a free ebook copy of TORN. Can you tell us a little bit about yourself? Let’s see, I’m a writer so that should tell you I’m a bit off my rocker. I’m a former middle school English teacher so that lends itself to the crazy part too. J I’m a stay at home mom with everything that entails. I’ve been married for almost 9 years to the man I met when I was 14. As a child, my father was in the Army so I moved around a lot – I attended 13 different schools before college. I guess because of that, I am able to adapt to new situations pretty seamlessly. I have a younger sister who has taught me a few things about being an adult over the years. In general, I’m pretty normal expect for the off-the-rocker bit. Is there any particular author or book that influenced you in any way either growing up or as an adult? Fahrenheit 451 by the late Ray Bradbury helped me to look at fiction in a new way. The story was brilliant and way ahead of its’ time in terms of how the world operates. He was familiar with reality tv before there was such a thing. Also, A Separate Peace by John Knowles. I don’t know what it is about that book but I just loved it – the story behind it, the message it sent – amazing book. What are you reading? I am finishing up the Hunger Games Trilogy. I really like it but by book three, I’m not terribly impressed with Katniss. Don’t shoot me! I just think that by this book she should be more, well, just more something. Overall though, I really like the series. What do you do when you’re not writing? With two kids at home who play two different sports, I feel like we are always on the go. Sometimes I read, sometimes I veg out, other times I’m so busy, I don’t know where my day went. Lately, I’ve been promoting the heck out of TORN so I feel like I’ve been spending all my free time attached to my computer. When did you first start writing and when did you finish your first book? I first started writing TORN on my back deck and finished there too. Where do you get your ideas? I get my ideas from music. Lyrics to songs, the melody and tempo. I’m a music person too. I get a LOT of ideas from music. Are you a pantser? Or do you outline? Pantser all the way. I try to outline but I end up so far away from where I think I’ll be, I just go with it and let the story write itself. For example, the betrayal in TORN was completely changed around. It was too easy to write it the way I first thought it out so I changed it up and it ended up being a great plot twist – less predictable. Can you tell us the challenges in getting your first book published? I queried the hell out of TORN. I went to the NJSCBWI conference in Princeton, I had it critiqued, edited, ripped apart and sewn back together. All it took was three lines and a contest at SavvyAuthors to garner the attention of my current publisher. I consider myself lucky though – I finished TORN in June of 2011 and signed my contract with Black Opal Books by October. Tell us about TORN. TORN is a YA paranormal with some romantic elements. It’s a story about the yin and yang relationship between good and evil, hope and despair. It asks, if everything is all sunshine and roses, will hope fade way? Do we need the bad with the good? How did you come up with the title? The original title was CHOICES but I felt it was a little soft. I was talking to my sister-in-law, who beta read for me, and I asked her if she could feel Samantha going crazy. She responded that she wasn’t so much going crazy as she was torn about the situation. So, thanks Allison for a great title! Who designed the cover? Jay Sabo of JS Designs designed the cover. He’s amazing and I have him ready to design the cover for Three Days of Rain and BETRAYED. If you had it to do all over again, would you change anything about your latest book? I think I might’ve put it into 3rd person. I’ve fallen in love with my antagonist, Sebastian, and I feel he has a great story to tell. Who knows – maybe I’ll write one from his POV. Any new books coming out? Three Days of Rain was picked up by Black Opal Books. It should be out by the end of this year or early next year. Do you have any advice to give to aspiring writers? All I can say is to keep at it. Everything you write, everything you read, makes you a better writer. Take the good with the bad. Don’t get discouraged by rejections or bad reviews. Keep plugging away and it will happen if you really want it too. Cyn Balog taught me to realize that I had become an “I did” and had separated myself from the “want to’s”. Any parting words? I want to thank you for having me here, Leslie. I’m happy to be able to call you my friend. Being publishing “sisters” has allowed me to see what a great person you are, so thank you for all the chats, messages, shares, likes and conversations. Thanks for coming by Christine! One of the BEST things about this author thing was that I was able to meet some AWESOME writers. I’m happy to call you my friend and I’m looking for great things from you! Interesting post, ladies. I too am a panster and now proud of it. I read books on how to write a book and I can compare them to those parenting books that at time when I was a new mom, made me feel guilty about everything. The books that “teach” you how to write one, I find those exercises confusing and kind of feeling silly for doing them. I’ve tried to to them but got nothing out of them. When an idea for a book strikes me, I just put down a rough (point form) synopsis and usually don’t end up referring back to it. So it is possible to write a book without first fully outlining and plotting the story. In either case I think it takes time and dedication. I always start out with a basic outline, but rarely follow it. So I guess I’m a PROUD PANTSER too! I agree with out about the books on “writing”. They’ve never helped me. The best help I receive is from readers and critique partners. As to JS Designs, I can only say the guy is great. I totally love the cover of torn, and Jay also did my cover, so yeah, he’s a genius. By the way, TORN is a great title. So much stronger than Choices. And BETRAYED sounds just as intriguing. But I do hope to get this free copy of TORN, or else I’ll have to order it before the weekend. I do need something good to read. Thanks for stopping by Anke! And Jay designed my cover too! He’s awesome! I agree with you about the title. I love TORN. And BETRAYED sounds awesome too! Thanks for coming by Christine! It was my pleasure!!!!! Great interview ladies. Go Pansters!!! I don’t have the patience or resolve to sit and plan anything out, in my life or in writing. It’s far to tedious and it’s so much more fun to see ‘what happens’ along the way. Good luck with TORN, it sounds awesome.